There’s not much I can say about weddings at The Round Barn that I haven’t said before….it’s one of the best locations for a Vermont wedding. Period. I have this tradition of always photographing my bridal bouquets in the same spot upon my arrival on the wedding day. With snow on the ground for Christine & Chris’s wedding, well, this shot has quickly become one of my favorites. 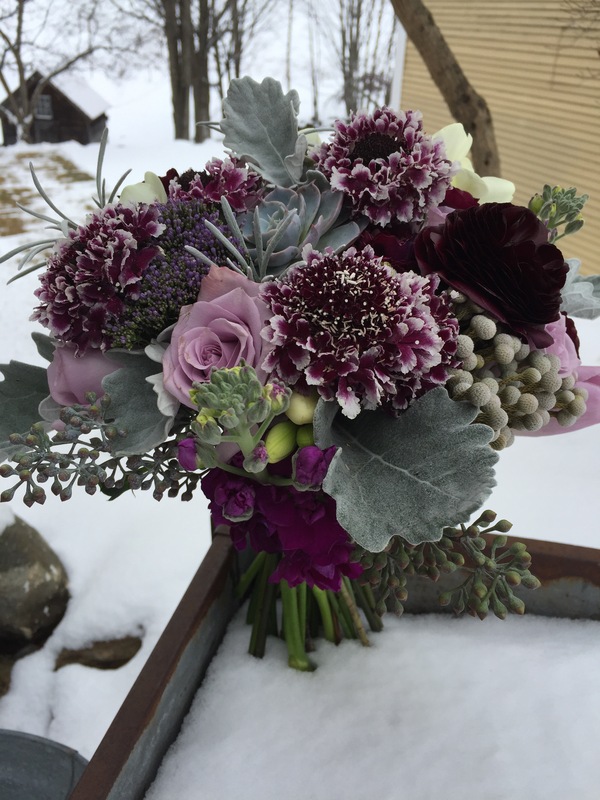 Flowers included in the bride’s bouquet include plum ranunculus, roses, scabiosa, lavender tulips, dusty miller, silver brunnia, white freesia, royal purple stock, trachellium, seeded eucalyptus & succulents. Two bridesmaids carried white roses, lavender spray roses, dusty miller, succulents, seeded eucalyptus, scabiosa & trachellium. The centerpieces were designed in wooden boxes to keep in step with the rustic-elegance of The Round Barn. The ceremony took place just a few miles down the road at Our Lady of The Snows. I have to just give a shout-out to this incredible scabiosa, ‘cherry vanilla’. It really was the perfect touch! It’s always a pleasure to take a simple suggestion from a client who says “anything in this palette of plum, purple, white and grey with green” and run with it. Finding these super sweet scabiosa when I arrived to pick up my flower order, well, that’s priceless! Nice post, Allison. Those scaniosa really are so pretty!